What grows green grass and Healthy Crops in Western Soils? Often our western soils have a problem with many of the 42 essential elements of plant nutrition being inhibited by the alkaline chemistry of the soil. This simply means that the elements such as iron, zinc, copper, calcium, etc, etc, etc, are cemented into the matrix of the soil by way of a precipitation reaction called concretion. This is where the term ‘Concrete’ comes from, where the mineral elements are not soluble with just water. The process of getting these elements available for plant uptake requires a “solutioning” of the elements from the concreted soil, which is provided by the supramolecular chemistry of the organic matrix of humic molecules, and by the mycorrhizal fungi that are hopefully also present. It’s one of the Mechanisms of Action for the Humic Molecules and the Mode of Action for the Mycorrhizal fungi. Another limiting factor is the availability of nitrogen in the form of amino acids, caused by a slow or weak Soil Food Web. The SFW is the Terrestrial Biosphere of Micro-organisms and soil animals of all sizes, which all contain protein. The largest most abundant part of this terrestrial biosphere should be coming from the cycling of mycorrhizal hyphae as they are constantly being replaced. It’s been reported that the individual hyphae of mycorrhizal fungi only function for 5 to 7 days before they are replaced! The cellular tissues of the hyphae have huge amounts of protein, which breaks down into amino acids, which accumulate in the soil and eventually get picked up by functioning hyphae of other mycorrhizal fungi and delivered to the plants as a major source of the nitrogen budget needed by the host plant. Much of the protein organic substances of the cycling microorganisms also gets consumed by the grazers of the soil (other microbes) where the caloric value of the protein is used to multiply into more microbes. This is where we screw up in landscaping or farming, when we supplement our crops or urban landscapes with high analysis fertilizers rather than find a way to instigate a better functioning Soil Food Web. Sure plants can use the 16% (plus or minus) analysis of nitrogen found in such products, but the best way for a plant to get nitrogen is by way of up-taking amino acids from the soil’s biosphere and not from acidified high salt index fertilizers. The high analysis fertilizers don’t provide a protein caloric value to the soil microbes and most of the nitrogen never gets used by the plant as it’s too easily lost. The result is a feast-or-famine-cycle! Here’s another way of looking at the situation. The plant needs the nitrogen in order to build important proteins and enzymes (also proteins), which is the same reason why we animals also need protein, for the nitrogen. However what we really need are the amino acids, which are the molecular building blocks of protein and which on a molecular scale contain the nitrogen. Think of it like building a brick wall, where the wall is the protein and the bricks are the amino acids. It’s better and more efficient for a plant to build the wall with bricks that already exist rather than to need to manufacture the bricks before it can build the wall. This is how Nature’s molecular biology of plant nutrition and soil building works, so for us its prudent to apply bio-mimicry as our method of growing any urban landscape or farm crop than it is to just crank the N-P-K into the fertilizer system. Water is a growing concern in the arid West and it's a problem that will never go away. This paper addresses two situations that contraindicate the efficient use of water in both urban landscaping and in agriculture, particularly where irrigation is essential. The first problem I'll cover is the compaction of soil. This prevents water from penetrating to an adequate depth, allowing roots to also grow deep, therefore providing plants with a greater contact zone with soil, where water and element nutrients can be found and sequestered. Compaction also causes a problem with roots rotting due to the soil being airless (anaerobic). Like us, roots and the beneficial microbes of soil need oxygen in order to survive and function properly, so compacted soils limit the functionality of roots and all the beneficial soil microbes. Soils can also be made anaerobic by amending them with organic matter that easily decays. This happens because the process of decay consumes oxygen rapidly causing the soil to spoil as it turns anaerobic. Adding organic matter to either water or to soil increases the BOD (Biological Oxygen Demand) caused by the microbes of that environment attempting to break down the caloric value of the organic matter, which requires oxygen. If the soil is extremely porous, providing rapid water percolation, then high soil organic matter is not a big deal, but in compacted arid region soils where the soil is collapsed, dispersed and compacted, it may not be a good idea to amend the soil with compost, peat moss, animal manure or other forms of easily decayed organic matter. The second problem limiting plant health is the increasing salinity of both our soil and our water, a problem across all western regions of agriculture and urban areas where fossil water or effluent water is used for irrigation. Soil also becomes increasingly saline (salty) because high analysis acid based fertilizers are often used. Fertilizers have a salt index, meaning they contribute salt to the soil! So soil salinity increases because we irrigate with water that can be saline, or high in TDS (total dissolved solids), we have high evaporative loss of our soil water, and our soils are often compacted, preventing us from flushing the salt out of the soil by irrigating with lots of high quality water. And in areas where waste water effluent is has been implemented it’s causing major salinity accumulation which can only cause a bad situation to get worse. Western soils are vulnerable to salinity accumulation because our water quality is not excellent and our evaporation rate is high, so the longer we irrigate and the longer we fertilize the greater the soil salinity becomes! As times continues the practice of irrigating with poor quality water and fertilizing with high salt index fertilizers, we shall first experience the symptoms of salinity by seeing the burning or dehydration of the foliage, and we shall see the collapse of the soil caused by the dispersal of the soil clay particles as the salt accumulates. This increases the compaction of the soil! Dispersal of clay is literally a collapsing of the structure of the soil causing it to seal, become hard and anaerobic, and inhibits water percolation. In addition, salinity will also inhibit water uptake into the plant as water will move in the wrong direction trying to equalize the concentration of dissolved solids in the liquid. If the concentration of dissolved solids (salts) is greater in the soil water than it is in the plants vascular water then water will leave the plant and go into the soil, attempting to equalize the concentration gradient of the water. The symptoms of dispersed collapsed soil are easy to diagnose by simply probing the soil to see how hard it is. You can use an inexpensive moisture probe for doing this. 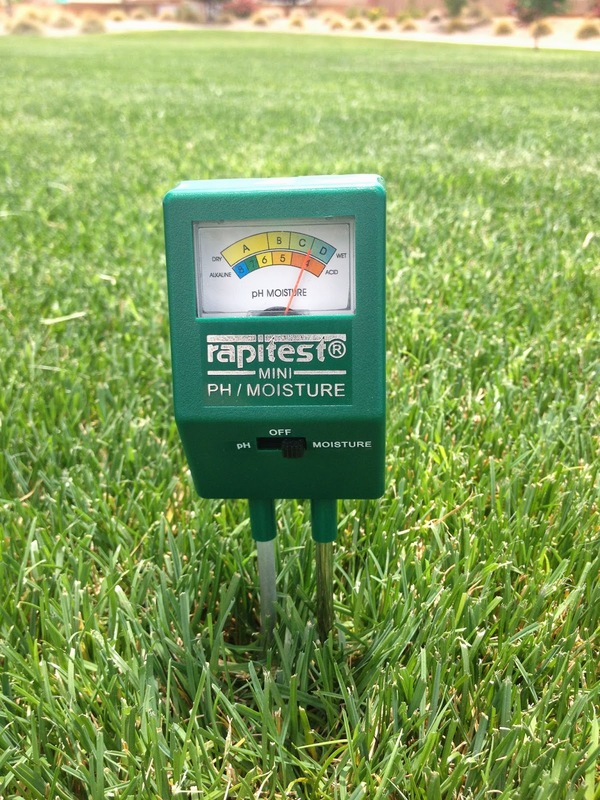 A photo provided in this paper shows a moisture probe used by a Phoenix Arizona Landscaping Co., which has been monitoring a park sports field turf area in Phoenix after using the Soil Secrets products, TerraPro and EndoMaxima. TerraPro is a unique formulated product made by Soil Secrets which contains a bio-identical "organic matrix" of Humic molecules that function as supramolecular. Because they have this molecular characteristic they are capable of assisting plants with water uptake, even under saline conditions. They are also capable of helping the soil particles re-arrange, un-compact and form a macro-aggregate structure. When TerraPro is applied on a turf area such as a sports field or golf course, even when high percentage Nitrogen, Phosphorus and Potassium fertilizers has been used, you will often see the performance of the grass improve. This is probably due to the improved water uptake into the vascular system of the grass and since water is an essential part of the chemical equation of photosynthesis, the grass gets greener. 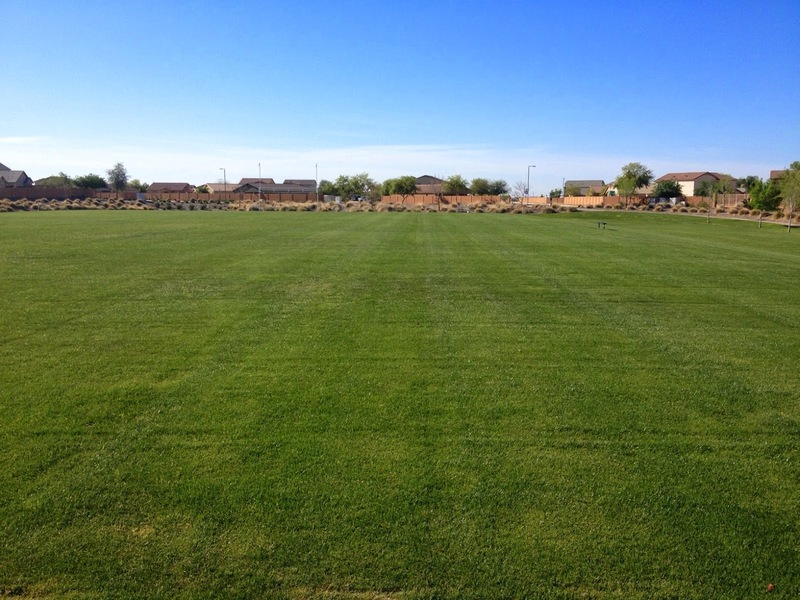 Phoenix Arizona Landscaping Co., water savings demo project on a park sports field. You can see that the right hand side of the field is noticeably greener than the left hand side. 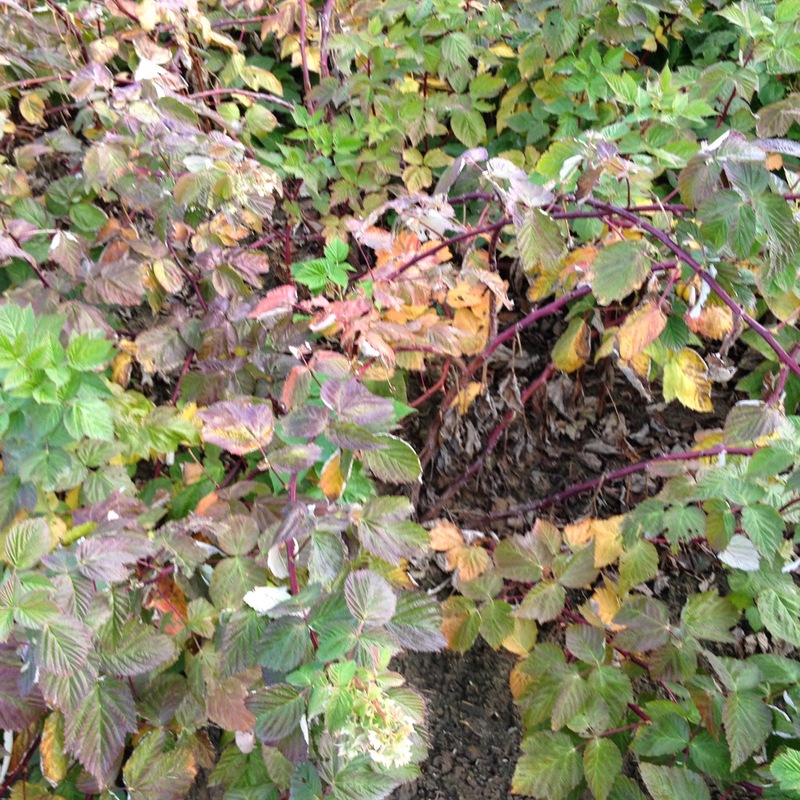 Photo was taken 2 months after treatment with both TerraPro and EndoMaxima mycorrhizal inoculant. The image of the soil moisture probe picture is about 4 1/2 months after the treatment in January of 2014. On the TerraPro treated side of the field the moisture probe was easily pushed 6 inches into the ground. On the non treated side, the probe would not penetrate more than a half inch before bending the probe. The results of this test have convinced the company to invest in a larger commercial probe for continued testing. 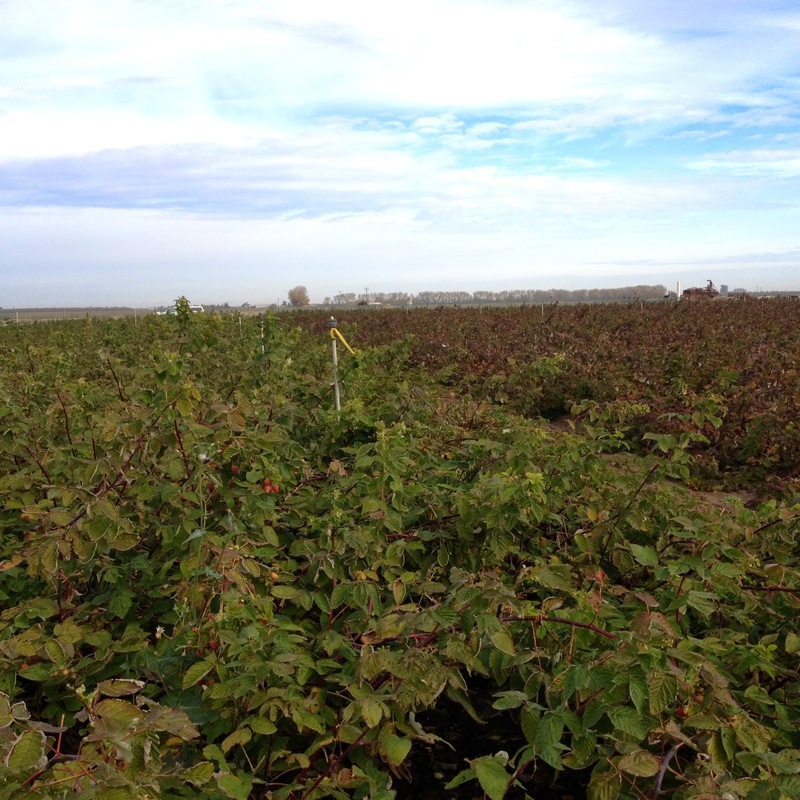 Salinity Test on Driscoll's Raspberries. Driscoll Strawberry Associates, Inc. Field on the left was not treated and was typical of fields being impacted by the increasing salinity levels of the farm water and soil. Field on the right was treated with the Soil Secrets TerraPro product and salinity damage was decreased. The photo below shows the treated field on the left and the control untreated field on the right. 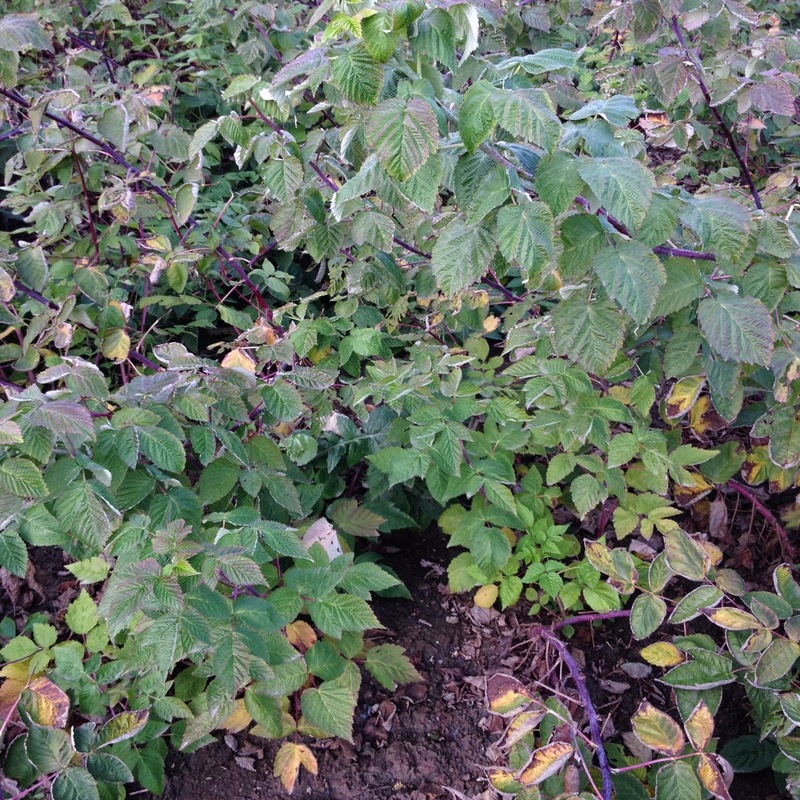 The reddish tinge on the right hand side untreated field is the burning of the foliage from the salinity!